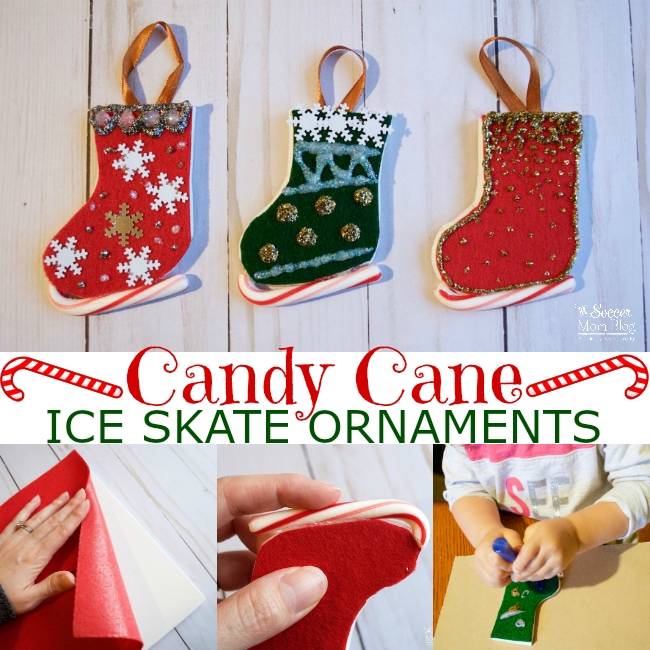 Inside: How to make Candy Cane Ice Skate Ornaments, an easy kids Christmas craft. 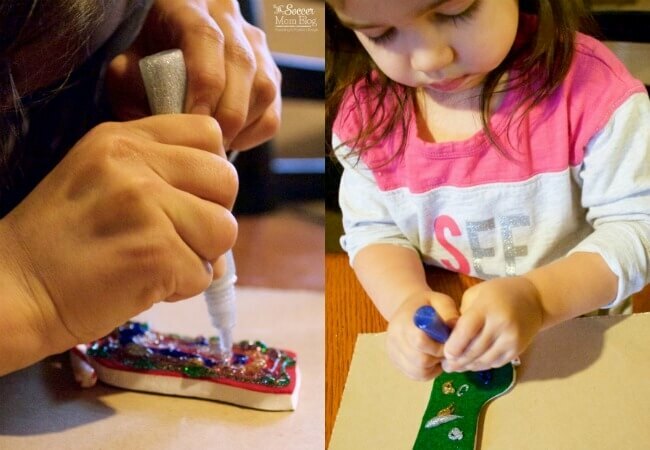 One of our treasured family Christmas traditions is an ornament-making party. We plug in our Christmas playlist, sing loudly, laugh, and craft the afternoon away! Last year we made deliciously fragrant Orange Pomanders, inspired by my favorite childhood Christmas stories, The Sweet Smell of Christmas. 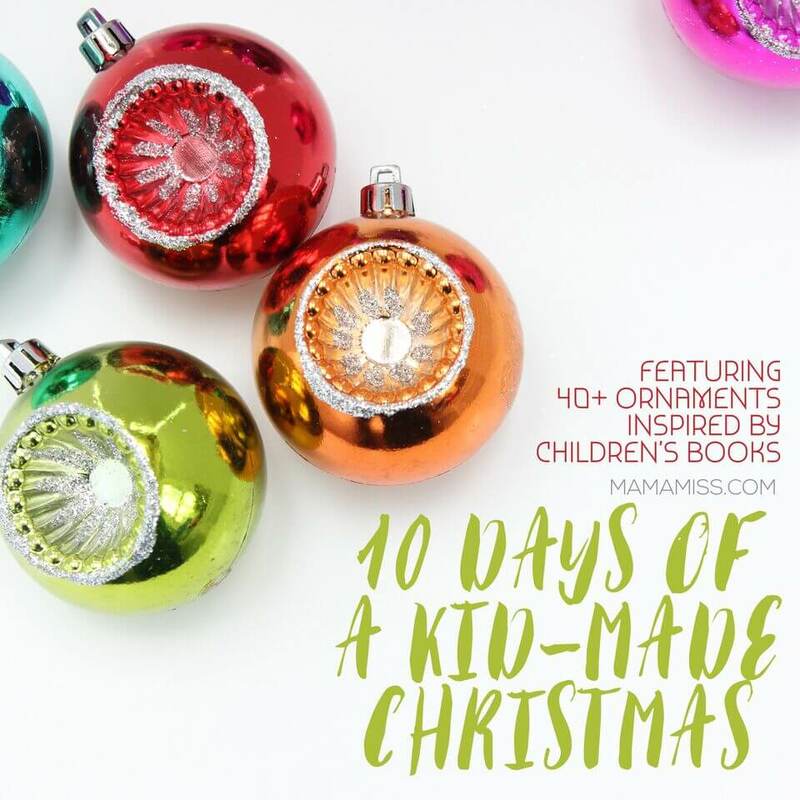 This year we based our craft on two books: Katie the Candy Cane Fairy and Santa! The inspiration we took from The Candy Cane Fairy is probably obvious…candy canes! Santa! 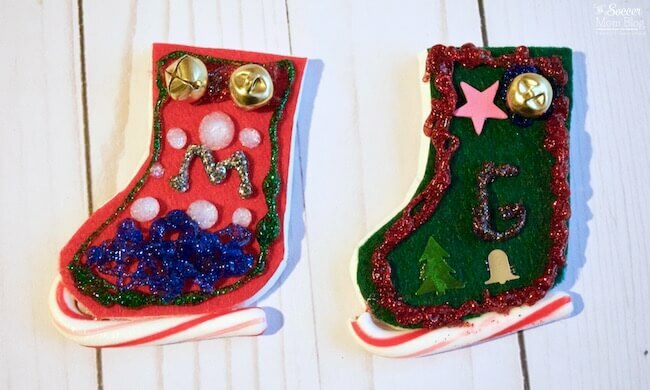 features a holographic ice-skating Santa Clause, so we combined the two for a fun and festive craft. Related: You might also love our Baby Bottle Photo Ornament! STEP ONE: Attach felt sheets to the foam. 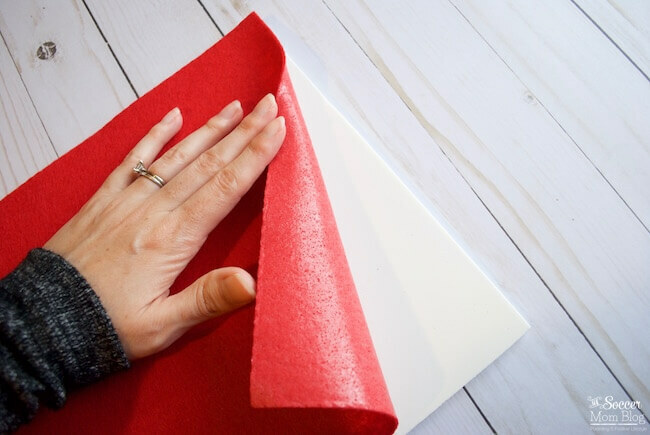 Adhesive-backed felt sheets make this step super easy and mess-free! STEP TWO: Trace a boot shape onto the back of the foam. We used a stocking-shaped ornament as our pattern. 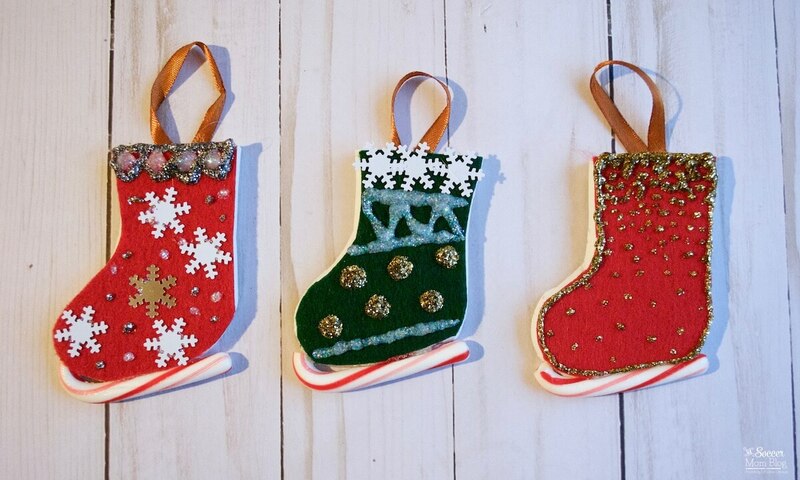 STEP THREE: Cut out your stockings. 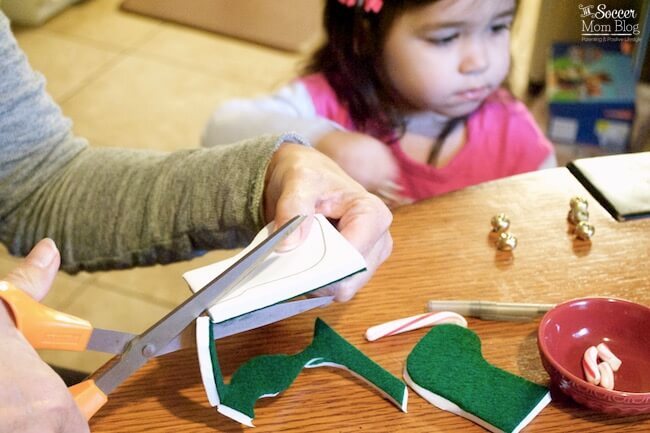 STEP FOUR: Break the candy canes on the curved side so that they will fit perfectly along the bottom of your skates. 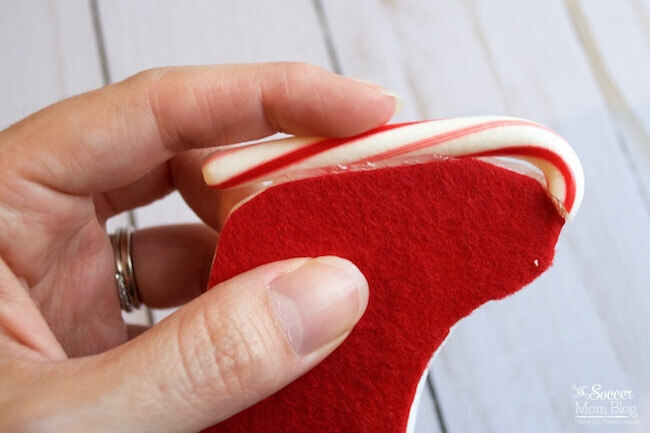 Attach candy canes to your skates with a glue gun. (My girls are on the young side, so I did this part for them). I also used the glue gun to attack a 4″ loop of ribbon to the back of the ornaments for hanging. See all of this year’s ornaments here!